Welcome to the first of February. How are you doing with your plans for 2019 so far? I’m on target with some things and behind on others. I’ve been at the whim of the weather with my efforts on the Heartwood Art site for the last 6 weeks. But, I finally got the shop all spiffied up and ready for use. You can read all about the journey in my latest post there. I also got my first load of lumber in, thanks to the gracious help of one of my sweet neighbors. I love this new ‘hood!!! I should be all set for at least my first 3-4 projects. And I spent all day Sunday trying to perfect my camera setup to do videos. You’ll be seeing my first one soon. And oh boy am I glad the shop floor and wall are nice and clean now!!!!!!! It’s not perfect yet, but it’s good enough to get started. That stark white wall is goofing with the white balance settings on the camera, and I’m wondering if I need to do another paint job with a nice oatmeal color to tone it down. But for now, I’m going with it like it is, and thinking when I add all of my shop benches and such, that will tone it down for me. I’ll have a post on my camera and setup as soon as I can get to it. But the point I want to make is that I’ve invested a LOT of time into getting that video setup right and I haven’t been focused on getting a video out. That made it more fun too. While doing that post I also noticed a bunch of things wrong with the site and email list and social media accounts. I REALLY want to change the theme sooner rather than later. And instead of reinventing the wheel and starting from scratch, I might actually do a take-off on the BlogAid theme. I’ve gotten such nice comments about the colors on the wood site that I’ll definitely be keeping those. So, that styling already defined should also help shorten the revamp. I’ll deal with a fully Gutenberg homepage and such in a few months. It’s going to be better to just chunk this out into sections than try to take it all on at once right now. My main focus has to be the rest of the stuff I found wrong. I decided not to use an RSS feed for delivering my posts via email. Instead, I’ve decided to hand craft an email telling folks about the new posts. I thought I was going to be able to reuse the RSS template I already had for that list, but nooooooo. So, I did a color revamp on a BlogAid template for now. But, I really want something pretty for those emails, so that’s another thing I’ll be hiring help for later. I also discovered something crazy on the Pinterest account I set up for this site. It has no boards and no pins and says it has 10.2k impressions a month. That’s just so whack, as is Pinterest, in my opinion. I also got the new YouTube account started and will finish it so I can release that first video that I made this weekend. And I changed the email I use for the site to a Gmail account and now the Gravatar is broken, so I’ve got that to fix. In so many ways, with the shop and the site, it’s like starting from scratch. But, I do at least have a headstart and a lot of knowledge to help me kick this stuff out quickly, and I’m grateful for that. I’ve also got a bit of a waiting list for site audits right now too. So, if you’ve ordered one, I appreciate your patience. I can only take so many projects at a time so I can keep all the open ones in constant motion and turn them as quickly as we can. Several audit requests last month turned into really big projects of host migration and then the site fixes, plus HTTPS. We’re making super good progress thanks to clients doing their parts quickly too. These things are definitely not a “dump it all on the tech” type job. The site owner is very much involved in making things better and making good choices based on their new education. Not only is their site getting all secure and fast and clean, they now know how to keep it that way too!! Last week I reported that my new speed tests were in progress. I’ve done all I’m going to do with them for a bit and I’m now actively doing the share button tests. I’ll keep you posted on those. I’ll be circling back to even deeper speed tests in a few weeks. But, I got this done in time for my meeting with the Mediavine folks later this week, and that’s what I was after. Of course, all of these new opportunities have delayed me working on the new Gutenberg blitz class, and that’s okay. There are still really big things coming down the pike with it, and I had just as soon wait for those to arrive before diving in any deeper. I may not be saying much about it lately, but you better believe I’m reading about it every day to keep on top of the changes. Speaking of Gutenberg, the roadmap for Phase 2 has been released. The really big thing in this will be to bring the Gutenberg editor to widgets, but that’s certainly not all. Navigation menus will get a Gute treatment as well. And, they are working on ways for us to register our own content areas. I’m not sure what that means exactly. I’m thinking it may be like defining a widget area in our content. If so, that is huge!!! Coupled with reusable blocks, that could have a radical impact on optins and ads and such. The rest of the post lists the other items on the agenda for Phase 2, several of which have to do with auto updates. They say it will take all year to get these things done, and that’s why I’m not waiting on this phase for my plans. I can and will make use of Gute before summer on the wood site, and have it primed for Phase 2 when that happens. I seriously doubt I will convert BlogAid related sites to Gute before summer, though, and I’m advising that most of my clients with well established, money-making sites hold pat for now too. Designers – heads up. There is a free webinar coming up on Feb 8 for page building with Gutenberg. For the past few weeks I’ve been reporting on big sites getting hit with non ADA compliance lawsuits and how this is going to be a hot topic from now on. I want to thank Michelle Phillips of Codefetti for sourcing this nice post from Calderaforms on things to check on a site for ADA compliance. It will most definitely help you understand what is required and give a wee bit of insight into why Gutenberg is not quite up to par with this yet. The Genesis framework folks released a minor update this past week. It just had a couple of bug fixes, and I haven’t heard any screams about it. So, I’m calling it okay for updating. Speaking of updates, good gosh there have been a LOT of plugin updates recently. 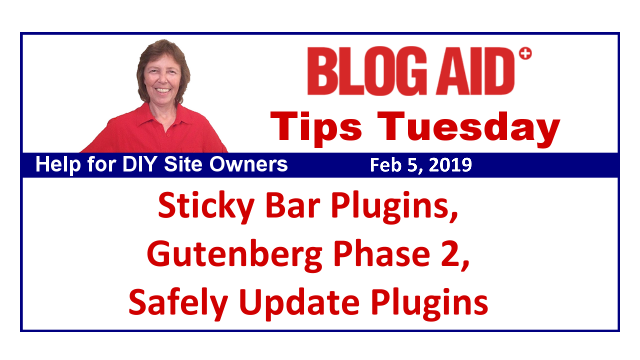 Be sure to see my post on how to safely update your plugins in a way that you can make use of the WP Rollback feature, just in case one of them goes plooey. The UpdraftPlus plugin has options to auto backup your plugins or themes anytime you do an update. Yes, it takes a little more time than just doing an update. But it’s far faster than a full update, and way faster than restoring your site if something goes plooey. So, do make use of that feature. And while the backup is running, open a new tab and go to your plugins page and actually click the View Details link in the description of any plugin that needs an update and see what’s in it. That way you’ll know what to check on your site afterward too. This past week I’ve seen several folks asking about the Hello Bar plugin. It’s okay, but it didn’t have all the features I wanted, so I chose the Icegram plugin. It has a strange interface, though, and is not all that intuitive to use, but I got it working. I was also delighted to see that the nice folks at Foo will be revamping their FooBar plugin. They reported that in their 2019 forecast post. I really like the folks at Foo and I use their gallery plugin on the Heartwood Art site. So, I’ll be keeping my eyes on the release of the updated FooBar. For the past few months I’ve been doing a lot of research into the best ways to make Heartwood Art a revenue generating site. I’ve stopped using the term “passive income” because there is no such thing. It’s a full-time job making a site make money, even if it rolls in while you’re sleeping. I’ve had sponsored ads and affiliate links on the site for years – sponsored by BlogAid, of course. But now I’m looking into getting serious about Amazon product links and monetizing the YouTube channel as quickly as I can get enough subscribers. In fact, that alone is making my video creation calendar for me. I will be posting the kind of videos that are getting hundreds of thousands of views for others already. And, back when I was actively posting, I would be contacted by woodworking-related product vendors about running sponsored ads. I suspect that may happen again as the year goes. All of those things should drive up my traffic enough to qualify for working with an ad network if I want to. But, I have concerns about the user experience with doing that. And I was so pleased to read this recent post from the nice folks at Mediavine that helps weigh the pros and cons of deciding when it’s time to put 3rd party ads on your site. I have clients making 5-figure monthly incomes with and without working with ad agencies. So, I know it can be done both ways. And, I also know that by just creating an enjoyable site for my followers, I got picked up by magazines and a book deal. Some of my clients have experienced similar results. So, we’ll see where this new venture takes me as I start adding the posts that will bring the eyeballs and the numbers needed to attract even bigger attention. Thanks MaAnna. Good luck on your woodworking site. My husband is talking about building a woodshop, so I’m sure he’ll be interested in what you are doing. I haven’t updated to the most recent version of Updraft Plus, because it says it is compatible up to WP 5.0. I’m at WP 5.0.3. Should I be concerned about that “.3”? No need to be concerned about minor point release compatibility. And for plugins like this, it’s not much of an issue at all with major release compatibility either. There’s not much of anything that changes in core that will affect it. Thank you for the mention, MaAnna! I’m glad you found the post on ADA compliance helpful and passed it along in Tips Tuesday. So glad you found such a great article to help us all understand more about ADA on our sites!! !